A double bill of films looking back at two of the most inspiring women to ever make use of a bicycle. One became one the world’s foremost travel writers - the brilliant and fearless Dervla Murphy - and the other was the time trial sensation that was the magnificent Eileen Sheridan. One of the most inspiring women to ever make use of bicycle, this charming documentary about one of the world’s foremost travel writers is a fascinating insight into the life of this brilliant author and fearless woman. 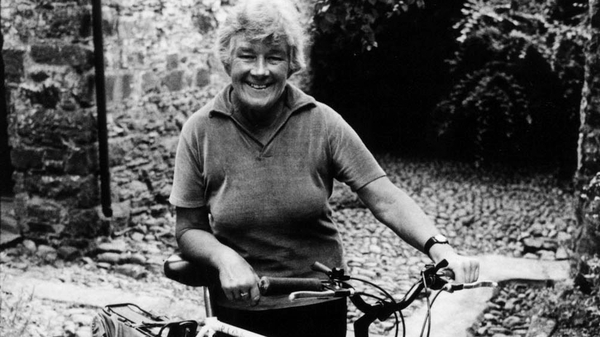 Dervla Murphy is Ireland’s most prolific travel writer, often described as ‘the first lady of Irish cycling’. Now in her eighties, for five decades she has traveled the world, mostly by bicycle, and turned each experience into a successful and fascinating book. Her first book, Full Tilt: Ireland to India With A Bicycle is regarded by many as the inspiration for travel in their own lives. For a young Irish woman to set-off cycling to India from Ireland in 1965, amidst the coldest winter on record, defines the unique strength within this wonderful author. Including rare footage of Dervla’s family home in Lismore and interviews with her daughter Rachel, publisher John Murray and broadcaster and travel writer Manchàn Magan, this is an inspiring look at this amazing and independent woman who turned her back on societal conventions to observe the world with wonder, curiosity and an astute political sensibility. If your looking for examples of how a bicycle can offer freedom and opportunity to broaden ones horizons and provide a vehicle toward discovery of the wider world, you’d be hard pressed to find a better one than the life of Dervla Murphy. This is the remarkable story of Eileen Sheridan, one of Britain's greatest ever cyclists, who defied the odds to become a pro-cyclist in the 1950s, setting records that would stand for decades. Eileen, now aged 90, gives a first hand account of her astonishing career, from early Coventry Touring Club days to her famous endurance rides as a professional.